If you haven’t ever been there, you have to go some time. But expect to be changed by your visit. Chartres is a town, one hour by train, southwest of Paris. 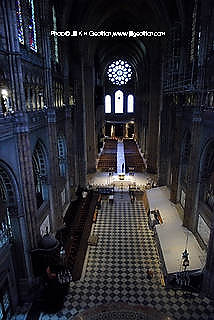 In it is a huge, beautiful cathedral, built at the beginning of the thirteenth century. My wife, Jill, and I journey to Chartres once a year for a ten day spiritual retreat. When you walk inside of the cathedral, you are immediately struck by the immensity of the sanctuary. The pillars stretch up into grand arches that lift your eyes and heart toward heaven. The stained glass windows are breathtaking. The labyrinth on the floor is intriguing. My favorite thing to do in the Chartres cathedral is to quietly walk around, hum the Lord’s prayer, and pray. I like to spend hours sitting in front of a statue of Jesus. This year I gravitated to a life-sized crucifix–a cross, with a figure representing Jesus nailed to it. Each day I took time to simply look at him and think about his love and self-sacrificial death. At times, I did my Bible study there, looking up from my Bible periodically, remembering to silently ask Jesus how the verses apply to my life. Often, I just sat there in Jesus’ presence, letting my mind wander and thinking about what’s going on in my life. I know God is present everywhere, but it’s different there. Somehow sitting in such a grand house of worship, with a figure of Jesus on the cross in front of me, surrounded by stained glass windows and sculptures telling biblical stories, makes me more aware of God’s presence. I find that I want to pray. I want to connect. I want God to speak to me. This year, I have been reading and thinking a lot about differences among Christians and differences between Christianity and other religions–especially, Islam, Buddhism, Hinduism, and New Age beliefs. I’ve been deliberately seeking out people whose faith is different from mine. I want to understand them better. I’ll admit, I originally mostly wanted to make myself feel better about being a Christian. I wanted to find the faults in others’ beliefs to strengthen my own confidence in mine. But I’ve been discovering a surprising thing. The people I’m meeting are a lot like me, and share many of the same values I hold. They’re often people who love their families, want to honor God with their life and practice, and want to do good and make the world a better place. So my search has changed. Instead of just looking for the differences, now I’m also looking for how God is working everywhere in the world, in different traditions, through and in spite of official dogmas and traditions. I’m amazed at what I’m finding, and eager to stay on the journey. I’m more glad than ever to be a Christian, and my love for Jesus keeps deepening, but I’m also amazed at the people I’m meeting and what I’m learning from them. I discovered that the crucifix had been positioned inside of the ecumencial chapel in the cathedral. As I wrestle with deep spiritual questions, I was being drawn to sit with Jesus, in a place devoted to celebrating points of common faith among divergent traditions. I wonder what God is going to show me next….